Over the summer we have had a bit of a change and some of the areas have had a move around. This last week the children have been settling into their new environment and exploring the resources available and learning how to play with them. 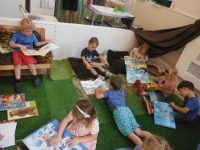 It’s been lovely to see the children’s interests develop, here they are looking at the books in our reading area and it’s been nice to see them choosing to revisit the area over the week.